This Mountain View diner, formerly the Mount Vista diner, among other names, is now Virginia Auto Group Used Cars. It is located at 1718 N. Shenandoah Ave., Front Royal, VA. 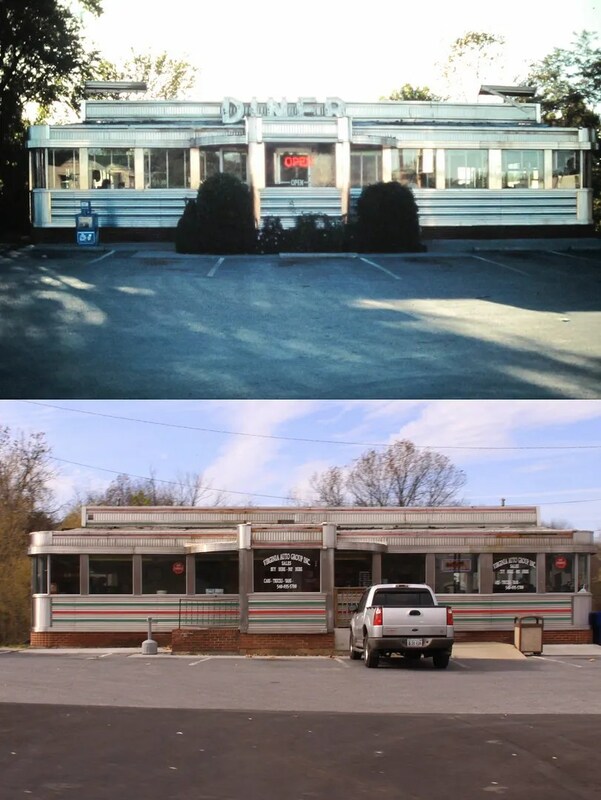 The small town of Front Royal used to be rich with diners, and was formerly home to the Eat Well diner, a brightly painted homebuilt, this one, and the Fox Diner, a ’50s Donut Dinette- a small metal diner- concept chain that used to have locations through the Southern states. There was also the Royal Dairy, a fantastic old lunch counter / restaurant. The Eat Well is long gone, the Fox was demolished several years ago, and the Royal Dairy was gutted. The former Mount Vista Diner (by the 1990s known as Sandy’s Diner) is 1957 Mountain View #489. It opened in Crownsville, Maryland and was moved to Front Royal c. 1963. The first picture was taken in the early 1990s, the second was taken yesterday. This entry was posted in Diners / roadside related, Diners/ restaurants, Mountain View by Spencer Stewart. Bookmark the permalink. So sad. Always used to eat there on the way to or returning from hiking/camping in Shenadoah National Park. And today it has been moved onto a trailer and moved again. Supposedly to Winchester VA for storage. We was told it was put on a Trailer and just moved to a new home.. Was it demolished? There are a few of us Front Royalians trying to figure out how the man who was Greek and owned The Mt. Vista for years spelled his name. I have researched and can’t find anything. Tia.